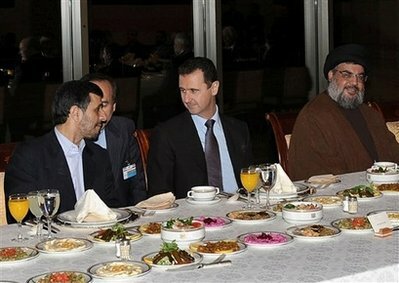 Iranian regime President Mahmoud Ahmadinejad, Syrian dictator Assad and Hezbollah terror leader Hassan Nasrallah met for dinner in 2011 in Damascus. Hassan Nasrallah (far right) has made few public appearances since 2006. This dinner was held right after US Undersecretary of State for Political Affairs William Burns’s visit with Assad in Damascus. Hezbollah terrorist leader Hassan Nasrallah has reportedly offered Syrian dictator Bashar Assad safe haven in Lebanon. Nasrallah also offered fighters to Assad to quash the revolutionary forces in Syria. 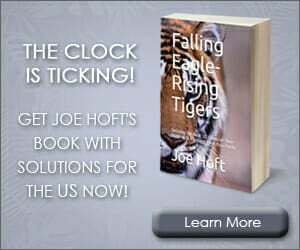 Hassan Nasrallah, Hezbollah’s Secretary General, has offered refuge in Lebanon and elite military units to Syrian President Bashar al-Assad, as the latter continues his fight to remain in power. In a recent conversation between the two leaders, Nasrallah told Assad that “Hezbollah’s elite units will stand at the front and fight the rebels,” according to a report in the Egyptian newspaper Al-Gomhoriih. While Syrian diplomats continue to defect – including reports on Wednesday that officials in Cyprus and the United Arab Emirates have left their posts – and fighting between government backed forces and rebel groups continues in Damascus, Hezbollah has offered safe refuge to Assad in the event that his regime is removed from power. The Al-Gomhoriih report states that Nasrallah has offered Assad a safe haven inside Iran’s embassy in Lebanon. Public discussions by Israeli leaders this week regarding Syria have dealt with the vast amount of chemical weaponry Assad’s government currently holds, and what the Israeli response should be if those weapons become vulnerable to falling into the hands of terrorist groups such as Hezbollah.